There’s an old riddle that asks: What travels 12,000 miles but never goes anywhere? The answer: blood. By the time it travels the length of our veins, arteries and capillaries—it has, indeed, gone 12,000 miles. This is a statistic among many found in Rose George’s Nine Pints: A Journey Through Money, Medicine, and Mysteries of Blood. Her nonfiction investigative reporting carries the reader through a plethora of topics rooted to blood: donation, transfusion, leeches, HIV, hemophilia, menstruation, trauma, and even vampirism. 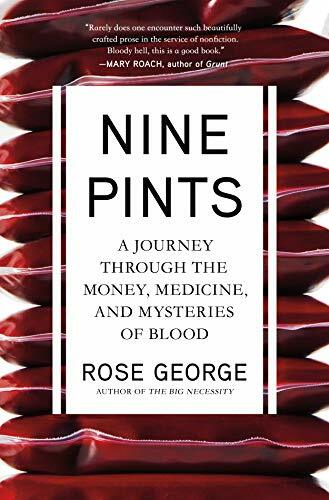 Nine Pints—whose title alludes to the number of pints of blood circulating in our bodies—is part history, part essay, part investigation, but is a conversational and expansive narrative whose brisk pace flows along faster than, well, blood. One of the most rewarding chapters concerns leeches. The bloodsucking worm rose to prominence in an era that believed illness resulted from too much blood. Thus began bloodletting, by which the leech, too, gained importance. In 1816, the King of England endured 36 leeches when he fell ill, and in 1825, the Russian Emperor (despite protestation) begrudgingly accepted leeches on his head when he caught a fever. The leech took off in France when a surgeon in Napoleon’s army encouraged leeches as therapy for trauma and inflammation: a baby needed 3, a woman 15, and a grown man 60. By 1833, France was importing 41.6 million leeches. George brings this fascinating history to the present by visiting the British company Biopharm that breeds and exports leeches for medical purposes. In 2004, the FDA crowned leeches as “a marketable medical device,” and today, leeches are especially used for salvaging essential body parts like fingers, ears, and penises. According to Nine Pints, in cases of severe bleeding in areas with a preponderance of minuscule capillaries—only a leech will do. After a section profiling the Vaughans, the couple who started the world’s first blood donor pool and who ushered in the blood collection system, blood becomes more current. George visits South Africa, and she investigates the subjection of women and the rampant sexual activity (not always consensual) that contributes to a high HIV prevalence. Nine Pints’ chapter on plasma (“The Yellow Stuff”) oscillates between the persons dependent upon the blood product—those with hemophilia like Neil Weller and Justin Levesque—and those responsible for making it. The “rotten” disease hemophilia crippled its sufferers until factor plasma products arrived as therapy. But then, as countless sources tell us, HIV infected these products. George revisits the unsavory practice by plasma manufacturers of recruiting donations from U.S. prisoners, and she provides evidence of the manufacturers’ knowledge of HIV and hepatitis C in their products during the 1980’s HIV scare. An ethical debate of paid vs. volunteer donations percolates in this section, with George claiming that paid donors “are more likely to lie” about their health and making subtle suggestions that the U.S. may be most at risk since the U.S. pays the most for donations ($30-$50) and allows persons to donate more frequently (2x week) than any other country. Nine Pints is a fascinating read. George invites the reader to learn about figures such as the “Menstrual Man” who invents an affordable pad-making system for disenfranchised women, and Jesse Karmazin who runs Ambrosia, a company that transfuses “young blood” into willing patients. Always able to uncover the remarkable nugget within her work—such as the Chinese counterfeit sanitary-napkin ring whose operation netted $22.7 million before its end—Nine Pints is full of surprises. George’s tightly-woven research propels the reader through the stories of blood—its wholeness, its parts, its relationship to therapy and disease, to people and places. A certain joy exists in reading a book so packed with esoteric, unique, and, yes, vital information. The book delivers on its promise: this superbly researched work is indeed a captivating journey through the histories and mysteries of blood. Shelby Smoak is the author of Bleeder, winner of both the 2013 Foreword Independent Publisher Book Award Gold Medal and Foreword Indie Book Award Gold Medal for Memoir. His poetry, fiction, and nonfiction have appeared in a numerous journals and magazines. After a long tenure in higher education teaching literature and writing he now works in healthcare policy and advocacy. He has also been a musician and performer in several bands.